Tanaka Shizuichi (Tanaka Seiichi in some older sources) was born in Hyogo prefecture and commissioned in the infantry in 1907. He graduated from the Japanese Army Staff College in 1916. He studied Shakespeare at Oxford University in England for three years and was military attaché to Mexico and the United States before serving in several military police commands. 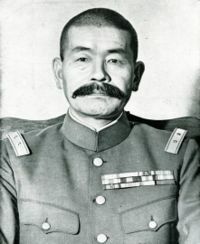 Tanaka was commander of Eastern District Army at the beginning of the Pacific War. He was given command of 14 Army in August 1942 but was recalled to Tokyo for staff assignments in May 1943. Promoted to full general in September 1943, he was given command of 12 Area Army (Eastern District Army) in March 1945. On the night of 24-25 May 1945, fires were ignited near the Imperial Palace. Tanaka organized fire fighting efforts, then offered to resign in atonement for the bombing, but his resignation was refused. Anami ordered him to tighten security and ensure public order prior to the public surrender announcement, 14 August 1945. He took command of 1 Imperial Guards Division when its commander was shot by young officers attempting a coup d'état to prevent the surrender, and successfully quashed the rebellion. He subsequently committed suicide, shooting himself through the heart on 24 August 1945.